The printing press of Herald newspaper, considered to be one of the largest in the state, caught fire today evening. There were no casualties, but the store room full with newsprint was burnt down into ashes. It is not known what kind of damage is caused to the printing machinery. Initial inquiry reveals that short circuit could be the cause of fire. Herald Publications GM Michael Pereira assured that they would come out with all the publications tomorrow, but with little low quality paper. Herald publishes English as well as a Marathi newspaper, Dainik Herald. Most of the fire tenders from all over the state were commissioned to try and bring the fire under control. According to eyewitnesses at the printing press, the fire got caught at the store room storing the newsprint and other printing paper. The workers, who had just entered when the mishap happened at around 7.15 pm, ran out for life. 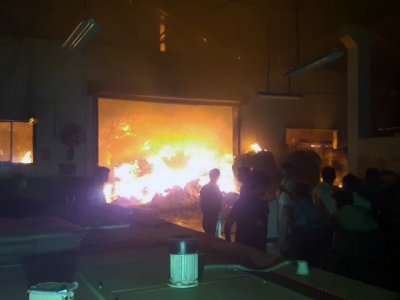 By the time fire tenders rushed to the spot, the printing unit having hi-tech machinery had already caught fire. Director of Fire Brigade Ashok Menon said they could bring the fire under control and even save the machinery by getting eight tenders from different parts. The loss is not yet assessed, but considered to be into crores of rupees.